The SAAA championships of 1900 were held on 23rd June at Powderhall Grounds in Edinburgh on a day of brilliant sunshine, reported to be ‘perfect for athletes’. It was notable for WH Welsh’s triple victory in the 100 yards, 220 yards and 440 yards races in 10.4, 23 and 51.6 seconds respectively. The half and the mile were both won by J Paterson in 1:59.6 and 4:37.4. Paterson had already won the 10 miles on 7th April, also at Powderhall in 57:32.2 which gave him a treble too! AR Gibb won the Four Miles from DW Mill who had also been second in the Ten Miles. RS Stronach won the 120 yards hurdles in 16.8 seconds. The by now established long jumper Hugh Barr won his event for the last time with a best of 21′ 10″ – it would go to Stronach in 1901 with 21′ in a tie with GC Anderson. The Shot was won by DJ McRae with 38′ 10″ from MN McInnes but McInnes won the Hammer with 108′ 10″ from MacRae. The only record to be established was the 880 yards where Paterson’s time was a championship best performance. Stronach was an interesting character and a top-class sportsman. Born in Partick, 19th May, 1882, he was educated at Glasgow Academy where his sporting talent was recognised and rewarded. In 1901, still a teenager, he was capped for the Scottish rugby team as a flanker. He won the SAAA 120 yards hurdles for the first time in 19000 in 16.2 nd was second in the Irish International. Thereafter undefeated in the Scottish championships or Internationals. 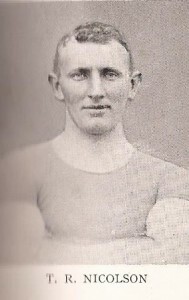 He missed the championships in 1902 and 1903 but other than that won every year until 1907. He set a new Scottish record of 16.0 seconds which he ran several times. The top hurdler in Great Britain, never mind Scotland, he won the AAA Championships three times (1904, ’05, ’06). 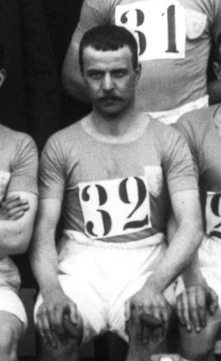 He ran 15.8 at the West of Scotland Harriers meeting at Ibrox on 29th July 1905 – a record that stood for 43 years. He emigrated to Canada in 1908 and Scotland lost a great athlete – he was a great loss in other sports as well. The 1901 championships were held at Powderhall on what was described as a ‘fair’ day with South and South Westerly winds, ie behind the runners in the sprints. 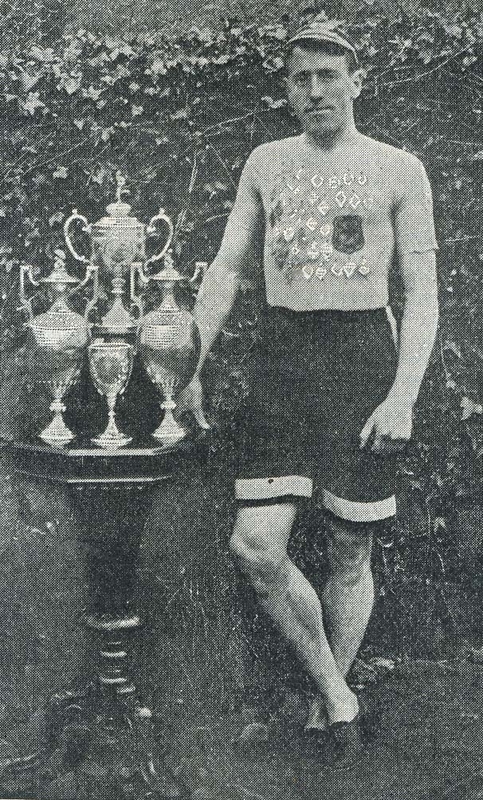 It was 22nd June and J McLean who had won two silvers in the sprints in 1900, won two gold medals in the sprints this time while WH Welsh had two third (100 and 220 yards) and a gold in the 440 yards. The only other double winner was MN McInnes in the Shot and Hammer events. The Ten Miles had been held at Hampden Park on 6th April with only one competitor finishing the event – DW Mill – in 55:16.4. The championships had opposition from another fixture in Glasgow – Celtic FC put on an athletics meeting on the same day which was said to be very well attended. The latter event included a 120 yards flat race with 23 Heats, a 220 yards, an 880 yards with three Heats, an Open Mile, a race for youths under 16 and cycle races too, as well as the inevitable five-a-sides. The top quality men were out at Powderhall. McLean of Blackheath Harriers won the 100 yards, being clear by halfway despite ‘R Steel getting the best of the pistol by fully two yards.’ The next event was the half-mile, won by JT McAuslan of Dennistoun Harriers in 2:02.8. “At the bell, Paterson (Watson’s College) led from Black with McAuslan in the rear. This order was maintained until close on the post. While the holder was watching Black, McAuslan came up on the inside and won a good race by half a foot.” The next track event was the 120 yards hurdles which Stronach won in 16.4 (a best championship performance) from GC Anderson. Then came the 220 yards which McLean won by two yards with Welsh, the holder, half a yard further back. Paterson made up for his lapse in the half-mile by winning the Mile comfortably in 4:44.4, and hard the race won 40 yards from the tape. In the Four Miles, there were only three men left on the track at the bell, and DW Mill (Clydesdale Harriers) won won in 21:15 from A Wright of Wellpark Harriers. In the field events, Stronach won his second gold medal of the day when he won the broad jump in a tie with GC Anderson when they both cleared 21 feet exactly. 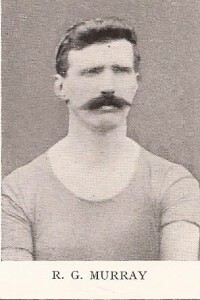 RG Murray (Clydesdale Harriers) won the high jump. * Decided 4th April at Powderhall. Throwing the Hammer: BCP and Scottish Native Record. “As a contribution to progressive athletics the championships at Ibrox Park on Saturday do not rank high in the records of the SAAA. Of the eleven events, nine were appropriated by four competitors, and in every case with the exception of the 100 yards the winner was vastly superior to the second man. This is not by any means a healthy state of affairs, and it demonstrates what many have long contended, that we are very deficient in first class talent. Fortunately there are several clever colts coming to the front, and in another year, perhaps, the honours will be more widely distributed. John McGough, of Bellahouston Harriers, realised his ambition by winning the half, the mile and the four miles. His mile performance – 4 min 27 3-5th sec – was the best and only twice has it been excelled in a championship – in 1897 when WH Welsh did 4 min 24 1-5th sec, and the year previous when W Robertson at the Union Championships at Hampden Park when he did 4 min 27 1-5th. Saturday’s casket of results go to confirm what we have more than once stated, that next to Welsh, McGough is the most outstanding figure in Scottish distance running. His half-mile time s also good – 2 min 1 3-5th sec – considering that he was never fully stretched. McGough may enter for the mile and half mile English championships next month and, though he can scarcely hope to win, he at all events may be trusted to uphold the good name he already enjoys. * Decided on 3rd April at Ibrox. Four Miles and Throwing the Hammer were both Championship Best Performances. It was back to Powderhall in Edinburgh on 25th June, 1904 on a showery day with westerly winds for the SAAA championships. McGough again won the half mile and mile but chose not to contest the four miles, which was won by A Wright in 20:33.8. 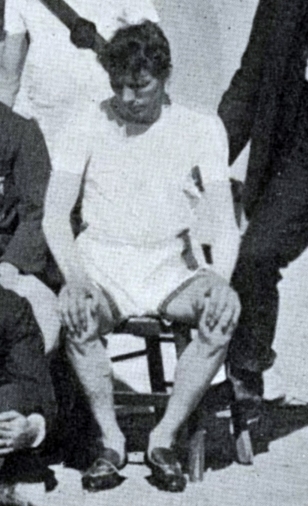 Other double event winners were RL Watson in the 220 (22.8) and 440 (51.6), and almost inevitably TR Nicolson in the Shot (42′ 6″) and Hammer (154′ 1.75″). some old friends were back winning titles – JP Stark in the 100 (10.2), RS Stronach in the hurdles (16.2 – a CBP performance and Scottish Record), and RG Murray in the High Jump (6′ 0.5″ – also a CBP, Scottish Record and Scottish Native Record). The 220 yards and Hammer were also CBP’s. * Decided at Powderhall on 1st April. “Not a little of the excellence of the Amateur Athletic Championships at Ibrox Park on Saturday was due to the superb weather conditions. We may have had more sensational championships; we certainly never had so many first-class efforts at a single gathering. General excellence, even in athletics, is better nationally than isolated achievements however great, and from this point of view we award a very high place to the championships of 1905. WD Anderson, Bellahouston Harriers, lowered native record in the half mile which now stands at 1 min 58 4-5th sec, and a remarkable thing in connection with this race, is that three men finished inside 2 min which is unprecedented as far as SAAA Championships go. Anderson has taken years to justify our prediction and now that he has succeeded we congratulate him warmly on his brilliant running which exceeded anything believed to be within his compass. Another feature of Saturday’s championships was JP Stark’s double win in the sprints which he won comfortably. This was specially the case in the 220, in which he romped away from the holder, RL Watson. Stark must be in good hands and part of the credit for his success is, therefor, due to his trainer, whoever he may be. In Halswell, the quarter mile winner, we have a runner of whom big things will be heard, if we are not mistaken. He is still the ‘raw material’ . When he is polished and nurtured, it is hard to say he will accomplish. In the half-mile he ran with no judgment: had he managed things better, he would have won, and the record would be lower than Anderson made it. Halswell was more at home, however, in the quarter which he ran in 51 sec. 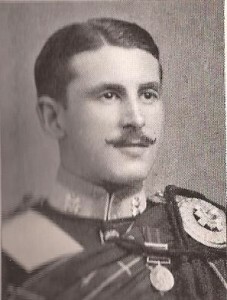 It was a very tight finish that he had with RL Watson: indeed many were of the opinion that it was a dead-heat, but the judges had no doubt and gave the gallant lieutenant (for Halswell belongs to the Highland Light Infantry, stationed at Edinburgh Castle) the honour. 440 yards: 1. W Halswell; 2. RL Watson; Time : 51 sec; 880 yards: 1. 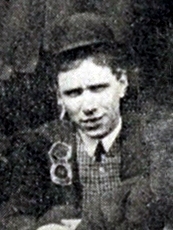 WD Anderson; 2. J McGough; Time: 1:58.8. Ten Miles*: 1. S Stevenson; 2. PCRussell; Time: 53:31.4; 120 yards hurdles: 1. RS Stronach; 2. GT Harvey; Time: 16 sec. Broad Jump: 1. HP McDonald; 2. JA Campbell. Distance: 21′ 3.5″; High Jump: 1. JB Milne; 2. P Watson; Height:5′ 9″. Putting the Weight: 1. TR Nicolson; 2. G Nicolson; Distance: 42′ 4.5″; Throwing the Hammer: 1. TR Nicolson; 2. G Nicolson Distance: 109′ 9″. *Decided at Ibrox on 1st April. Following the policy of holding the championships more or less turn-about between Edinburgh and Glasgow, the event returned to Powderhall in June, 1906. All the big names – Stevenson, Nicolson, McGough – were there but the biggest of them all was Wyndham Halswell who did not do the double, or the treble – he did the quadruple! The 100, 220, 440 and 880 fell to his credit. The report on the meeting will be in full, not because of laziness in the matter of editing, but because it gives a better flavour of the times and the meeting. “Taken as a whole, the twenty fourth annual championship meeting held at Powderhall on Saturday last, was a great triumph for the Association and for amateur athletics generally. The number of the spectators, and consequently the financial result, made it clear that when genuinely sound athletic contests are provided , and the voice of the ‘bookie’ stilled, enthusiastic and intelligent public support will not be lacking. Better weather could not have been desired by either competitor or onlooker. No wind, no rain, no broiling sun, and yet a trace of freshness in the air made the day ideal. Sharp to time the sprinters rose in a good start. McLeod, the Cambridge crack, showed first in front. Soon Stark was leading, and last year’s victory promised to be repeated, until about a dozen yards from the judges Halswell with a powerful dash rushed forward and won by fully two feet from Stark, closely followed by Kitson and McLeod. The three competitors in ‘putting’ acquitted themselves well. Kirkwood of the Liverpool Scottish Volunteers reached 44.5 feet with his first ‘putt’ and won the championship with 45 ft 2 in (1 ft 2 in beyond TR Nicolson’s Scotch record of 1905). In the half-mile, McGough with Vallance at his heels made the pace, Halswell and Anderson in pursuit. The leader’s first lap took 60 1-5th sec. Down the back straight McGough still led. Entering the finishing straight, Halswell drew up, and finished strongly ten yards in front of McGough. RS Stronach’s distinguished display over the hurdles, and TR Nicolson’s mighty hammer throw of 153 ft 10 in came next in order. In the 220 yards JP Stark (the holder)defended his title but the all-conquering Lieutenant was not to be denied and shaking himself free before entering the straight, finished a yard and a half clear of Kitson. Milne’s High Jump and McGough’s Mile were in accordance with expectation. Quinn, a remarkably fair heel-and-toe walker, won the three mile walk and his time, 23 min 1-2-5th sec, now displaces Harvie’s 23 min 15 sec of 1894. In the Long Jump McLeod won with 2o feet 2 in; and that pluckiest of athletes, S Stevenson, demonstrated his qualities as a distance runner by finishing the four miles in grand style in 20 min 41 2-5th sec. The report went on to discuss Halswell’s prospects and contained a review of his racing all that season before looking at the state of athletics in Scotland at that point. ** First time in championships since 1893. The report this time was as much philosophical as factual but still makes interesting reading. “Championships are interesting from many points of view, but chiefly because they are the concentrated products of of the best national skill and prowess for the time being. The history of the SAAA Championships is that of amateur athletics in this corner of the British Isles. Progress may not have been rapid but it has been genuine, with the result that in several branches of athletics, so-called, Scotland can now hold its own with its great traditional rival, England. In field events, like hammer and shot, we have led for some season, and that pre-eminence is likely to be reinforced at Manchester a fortnight hence by our representatives, T Nicolson and T Kirkwood, both of whom acquitted themselves well at Powderhall on Saturday, the former with a throw of 155 feet 8 inches, and the latter with a putt of 45 feet 7 inches. These performances have never been excelled at a Scottish championship meeting. The jumps, relatively, were scarcely so meritorious but the ground it appears was against the competitors, particularly in the high jump in which JB Milne only cleared 5 ft 4 in. RS Stronach did the hurdles in 16 sec, which would seem to indicate that he is as good as ever. The Glasgow Academical is a most consistent performer, and for the last three years has managed to maintain his speed, which is a tribute, if any were needed, to his athletic condition. Lieutenant Halswell was not so transcendant this year as last. Unfortunately he met with an accident, the precise nature of which has not yet transpired, which deprived him of the quarter, and, but for the commanding lead he had in the 220, he would have lost that race also. He, however, managed to cripple home. The quarter was the last event on the programme, and it was plucky of him to turn out. The task, light as it was (for T Vallance only took 53 seconds) was too much for him. Halswell captured the 100 yards . RG Duncan (West of Scotland Harriers) was the discovery in the two sprints in which he finished second. Reuben Kitson again failed to realise his hopes, and he will never have a better chance than he had on Saturday, as Duncan, with all the virility of youth, is certain in another twelve months to secure one of the sprint honours at least. The Scottish team was simply the first two in each of the championship events save for the Three Miles Walk which was not on the programme. McGough did run in the Mile for Scotland and won in 4:22.2 but there was no Halswell on duty that day. 120 yards hurdles: 1. RS Stronach; 2. WW McCowat. Time 16 sec. Putting the Weight: 1. T Kirkwood; 2. 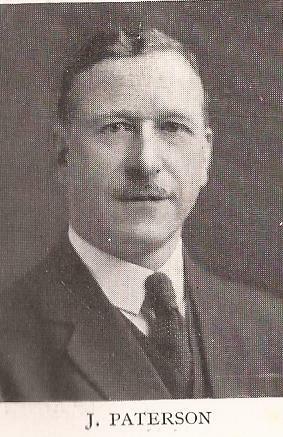 TR Nicolson. Distance: 45′ 7″. Throwing the Hammer: 1. TR Nicolson; 2. T Kirkwood Distance: 156′ 8″. * Decided on 6th April at Ibrox Park. There was a Scottish National Exhibition held in Edinburgh over six months in 1908. There were buildings for all the main exhibitors ( eg a Machinery Hall, Fine Arts Gallery, etc), there were exhibitors from the various Empire countries and it was a major attraction in the city – it even had special tram and rail routes out to Saughton where it was held. The SAAA held their championships at the Scottish National Exhibition on 27th June. The meeting had one Scottish Record and two CBP’s. The major change to the events was that this was the first year that the Hammer was thrown from a 7 foot circle – more about that later. Stark won the 100 and Halswell the 220 and 440 yards events, T Jack won the Four Miles and had already won the Ten Miles on 3rd April at Powderhall. Kirkwood and Nicolson repeated their double act of the year before with each taking a first and a second. 100 yards: 1..JP Stark; 2. RC Duncan. Time:10.2 sec. 220 yards: 1. W Halswell; 2. W Law. Time: 23 sec. 440 yards: 1. W Halswell; 2. ID Dickson. Time 51 sec. 880 yards: R Burton; 2. A Turnbull. Time: 2:02. * Decided on 3 April at Powderhall. CBP in 440 yards and Hammer is a CBP and Scottish record (First time thrown from a 7′ circle. “The complete success which attended the twenty sixth championship meeting conducted on Saturday last in the Edinburgh Exhibition sports enclosure by the Scottish Amateur Athletic Association fully justifies the belief that in Scotland the public taste for athletic fetes is rapidly reviving. Some time before the first event was due the commodious stands were filled with enthusiasts prepared to endure the glare and heat of a broiling afternoon, and truly the weather conditions tested fully the genuineness of their devotion. But while personal discomfort must have been experienced, the total effect of the crowded benches was a joy to all, but especially to those who year by year ave striven to promote a healthy interest in athletic sports. The Association have deserved well at our hands, and a success such as that of Saturday is, we doubt not, the most welcome form of recompense. To come now to the performances, it may be said at once that, although the various events were keenly contested and productive at times of no small measure of excitement, there is little to record as superior in the “record” sense with the exception of TR Nicolson’s magnificent 162′ 8″ throw of the 16lb hammer from the 7 ft circle. In view of this new record we may confidently look forward to our champion’s appearance in the English contests and the Olympic Games. The other “heavy” event, which fell to T Kirkwood, with a put of 43′ 8.75″, would not give grounds for high hopes in this competition, were it not for the fact that Kirkwood can, under favourable conditions, approach 47 ft. The “high jump” points to a marked defect which time and increasing encouragement this phase of athletics is now receiving will cure. Somewhat more hopeful was the broad jump result, G Stephen of St Andrews covering 21′ 11″. Our hurdlers are just a little slow, yet Watson’s 17 sec was an excellent performance. The New Zealander Halligan did better hurdling than at the West Harriers meeting, but was placed third. It is hoped that Gordon and Watson will give good accounts of themselves against Ireland on 11th prox. Of the flat events it is hard to say which aroused the greatest interest for, with the exception of the “four miles” which Jack secured in 21 min 52 2-5th sec, each contest was more exciting than another. Stark, Duncan, Halswell and Clark were rivals for the ‘100’. After a fault by Clark, the four got off to a fairly even start. At half distance Stark improved his position slightly, and running strongly won from Duncan in in a little worse than 10 1-5th sec. Beyond question Stark is Scotland’s best hope in the 100 yards contests in the English championships, against Ireland and in the Olympic Games. That Stark was in a trial last week close to even time, that he two years ago not infrequently was better than 10 1-5th and that he has, after a considerable break, been able to return to the track with the splendid performance of Saturday, will gratify his friends and admirers and (which is of more consequence) will inspire the confidence that in the sprint Scotland will be worthily represented. The 220 yards final introduced unexpected excitements. Lieutenant Halswell, by far and away our best man at that distance, won of course. Yet he started badly and all down the finishing straight had to fight violently for his victory. Duncan started perfectly, and had the inside position and was leading until 50 yards from the worsted. The Lieutenant finished in the magnificent manner to which he has accustomed us. Nevertheless, in the interests of international results, we should like to see more advantageous starting on his part. Halswell’s time under the conditions of the race may be considered quite satisfactory. In the quarter-mile Halswell has no rival at present. He can equal his all-comers record of 49 sec when occasion demands as his 51 sec on Saturday testifies. As in the 220 yards, the Lieutenant was slack in his starting, but the suggestion of power in the finishing straight from a spectacular point of view atones for the hesitation after the pistol. Scotland has reason to be proud to have the Lieutenant’s brilliant services. It is impossible to doubt the result of the contests in which he is to engage as our representative. After the glories of the Exhibition, and in post-Olympic year the Championships returned to Glasgow, to Ibrox, on 26th June 1909. In conditions reported as being “dry. 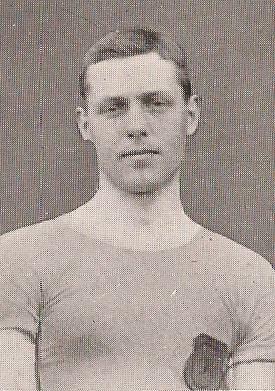 North and North-West Winds” there was a new sprinter to take the crowd’s attention – ID Dickson of Edinburgh University won the 220 and 440 yards and finished second in the 100 yards. There was only one other double victor and that was TR Nicolson in both throwing events. We were informed that Halswell ‘has retired from active participation’ and Kirkwood ‘has joined the professional ranks.’ Stark was not present and that was lamented although no reason was given, and McGough was second in the Mile. It was a ‘new look’ championships – but was it a good championships? “Of the many SAAA Championships it has been our privilege to witness, not one in recent years at least has been so prolific in strenuous competition and keen finishes as Saturday’s. Though there were no great individual feats, the performances at Ibrox Park were very creditable, and it is many years since there were so many competitors, not in one event but in all equally gifted. Two yards covered five competitors in the 100 yards, half a yard was all that separated first, second and third in the 220 yards final, four were inside standard (2:03) in the half mile, the winner’s time being 2 min 0 2-5th sec, the mile was won in 4 min 29 1-5th, less than a yard separating Jameson and McGough while McNicol and Welsh both beat standard (4 min 33sec), while in the four miles there was a dramatic climax, less than a foot separating A McPhee and T Jack. All these facts go to confirm what we have already said that, whatever the verdict be regarding the quality of the performances (and several are better than they look in type) there can only be one opinion regarding the keenness with which all these races were contested. Mile: 1. HT Jamieson; 2. J McGough. Time: 4:29.2. Four Miles: 1. A McPhee; 2. T Jack. Time 20:36.6. And so ended the first decade of the new century: some superb talent on display – WH Welsh, RS Stronach, RG Murray, TR Nicolson, WR Halswell, John McGough, Sam Stevenson – and many, many tight finishes. And a Press that swung from ‘the degeneracy of athletics’ to the most fulsome praise imaginable! What has changed in that respect? But it was an interesting period The next decade would be seriously curtailed and many careers cut short by the War, but it would introduce Robert Soutter and Duncan McPhee, James Wilson and GCL Wallach and several others – while TR Nicolson would continue to march on into the record books!